Bow hunting giraffe South Africa with Mkulu African Hunting Safaris. Bow hunting giraffe South Africa is one of the ultimate trophies to harvest when bow hunting plains game in South Africa. Bow hunting giraffe is going to challenge your patience. Just because giraffe are big animals that are seemingly docile, it does not mean they are docile. They run away at the slightest indication of something that looks suspicious. 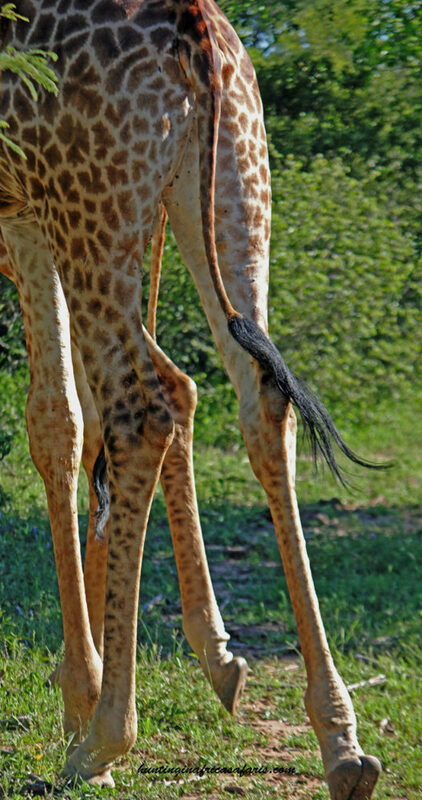 Giraffe have a very thick skin where the neck joins the upper body. Having said that it is nowhere close to the shot placement area. Still, the sheer mass of the animal allows it to take a tremendous amount of hammering before it will go down. Therefore, you need to use some of the best bow hunting equipment available. Stay away from mechanical broad heads. Only use fixed blade broad heads and the bigger the cutting area the better. Giraffe have no trophy value in terms of record books. The challenge to bow hunt one of these animals is the reason why they are becoming popular to hunt. If you do not have a high ceiling or a barn a life size mount is out of the question. Typically, a shoulder mount rests on the floor with the neck and head upright looking down at you. The back skin is about the size of a beef hide and can be used for leather, gun soft cases, furniture and almost any other kind of leather products. Hunters usually hunt giraffe after they have harvested numerous other plains game animals. To bow hunt a giraffe is to add this specimen to your collection. Good luck on your giraffe bow hunting safari. Below are a number of suggestions with regards to draw weight, shot placement and tips for bow hunting giraffe in South Africa. The giraffe bow hunting prices 2019 South Africa is $ 2 950. The giraffe prices have remained unchanged for the last 4 years. (iii) minimum arrow weight of 750 grains. The minimum kinetic energy (KE) required for bow hunting giraffe is 90 ft / lb. Average shooting distance is 30 – 40 yards. On a broad side shot it is recommended to place the arrow right behind the shoulder of the giraffe approximately 11” back from the two knobs on the chest, in line with the front leg. This shot will result in a high heart / lung shot leading to the giraffe expiring in the least amount of time. These shots are risky and should be avoided due to the sheer mass of the animal. On a quartering away shot care should be taken not to attempt to have the arrow penetrate through too much stomach content. Place the arrow in a spot bisecting the angle formed by the front legs into a position one third of the way up from the bottom of the brisket in line with the two knobs on the chest. Giraffe are mostly bow hunted on a walk-and-stalk hunt due to very little hunting pressure. Do not think these tall animals will be an easy bow hunt. Quite the contrary as they always seem to see you approaching them and always seem to be out of range. Use good camouflage clothing and be prepared to stalk numerous times. Best shot presentation is when giraffe bend down to drink water. Giraffe can be bow hunted from January to December but for those who are heat sensitive we would suggest a hunt from April to October. We can and do bow hunt giraffe from January to December.